The Chess'n Math Association is proud to announce a very generous donation by Michael Yip, author of two excellent books "Checkmate University Book 1" and "Checkmate University Book 2". Mike also taught chess to youngsters for the Chess'n Math Association in the 1990's in Montreal and continued teaching when he moved to B.C. The Chess'n Math Association is the distributor of these books. Mike has decided to donate his future Royalties from these two books to the reigning B.C. grade 1 champion every year beginning in 2010. Royalties earned in 2009 will go to the winner of the 2010 B.C. grade 1 champion which is determined in the first half of 2010 provided this player represents B.C. at the Nationals of the Canadian Chess Challenge in the same year. The youngster will receive the prize in a presentation at the National event. The 2011 B.C. grade 1 champion will receive the Royalties earned in 2010 etc. 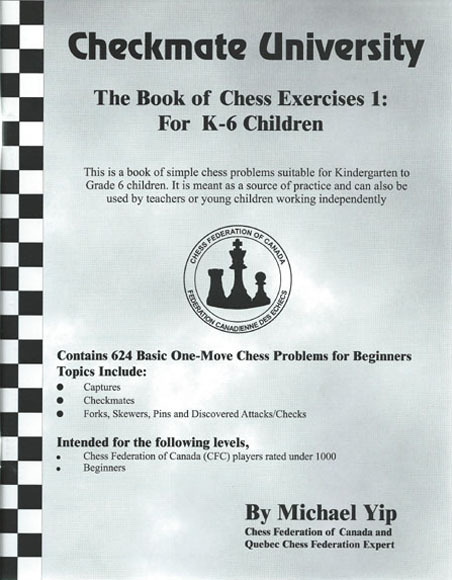 The Book of Chess Exercises 1: for K-6 Children. This is the first of a pair of checkmate execise books which start complete beginners off correctly, teaching them the basics of important checkmating postions in an easy to follow, workbook-style format with lots of diagrams. There are no frills in the production of the cover or the binding, but the information and the positions inside make this volume well worth the price. Designed for children, but it is great for beginners of all ages! This is an excellent checkmating workbook which imparts essential checkmating information to beginning students of chess! Algebraic notation, 104 pages, with a separately bound, 24 page answer-key.